The Last Days of Ava Langdon is an affectionate homage to the Australian author Eve Langley, (1904-1974), but it’s also an homage to eccentricity. In this generous and respectful fictionalisation of Langley’s life, there’s a boy who lives near Ava who taunts her each time he sees her. He calls her a nut case. That might also be the judgement of the Blue Mountains town where Ava lives in a hut on its outskirts, but author Mark O’Flynn contests that perspective with a portrait of a rich inner life, even if that life may have been compromised by the rudimentary and sometimes disastrous mental health services of the twentieth century. The real Eve Langley was a significant Australian novelist and poet but little is known about her. She was born into poverty but used her experiences as an itinerant agricultural labourer as material for her most famous novel The Pea Pickers (1942). Today she might be a member of the LGBTI community, but in the twentieth century her cross-dressing and what may have been intersex confusion was interpreted differently : during her sojourn in New Zealand she married and had three children, but she spent seven years in a mental health institution there. Did Langley’s husband use her gender identity issues to commit her, or was it because of the conflict between her passion for writing and the domestic demands of being a twentieth century wife and mother? O’Flynn has created his story with narration from an elderly Ava’s point-of-view. This moves between reportage of events, Ava’s sometimes muddled interpretation of the interactions she has, and her restless imagination using events, interactions and memories to conjure new characters and situations for her next novel. In this way the reader is offered multiple perspectives from the people Ava meets in what might have been her last day, which is divided into Morning, Elevenses, Afternoon, Evening and Night. Binding her day together is her sense of herself as a writer, compelled to write, to compose new stories, and to track the progress of the latest MS sent to her publisher, even though it has been a very long time since they’ve accepted anything. In the post office to send off her latest MS to Angus & Robertson, she meets an exasperated postmaster. Their exchange begins with his fruitless demand that she not bring her machete into the post office and then he has to check for her mail under two names. ‘Really?’ says the impudent fellow. The badge on his lapel says Officer Fowler. He’s young enough to be her grandson. Does she have a grandson? That’s another thing she doesn’t know. A part of her seems to remember him from somewhere. She holds out her hand and the policeman shakes it. Ava’s handshake is of the manly variety, solid and muscular, as if she’s pumping a cow’s teat. Bone crunching, if only she could crunch bones. What a skill that would be. ‘There’s been a complaint,’ says the policeman. Where has she seen him before? And so on. Ava is quite right, they do have history: Officer Fowler had to arrest her when she used the knife to attack a best-seller in the library. (She’s probably not the only author that would like to sweep popular rivals from the shelves). The Last Days of Ava Langdon is a playful yet poignant portrait of a life in extremis. It reminded me of the elderly heroes of Rodney Hall’s Love Without Hope and Matthew Condon’s The Trout Opera. But it was the chapter titled ‘Afternoon’ that won my heart: I’m not going to say a word about it because I want everyone who reads this book to have the same surprise, delight and then unwelcome doubt. Did it really happen, or was it a delusion? Don’t miss this one, it really is a very special book. 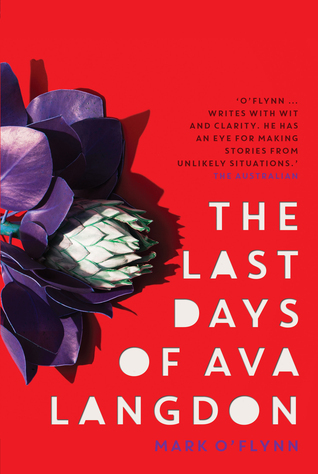 Available from Fishpond: The Last Days of Ava Langdon or direct from UQP and good bookshops everywhere. Sounds good and I have reserved it at my library. I don’t know about Ava, but Eve Langley was clear in her writing that she was heterosexual. My best guess is that her ‘male’ dress was a protest against restrictions imposed on women for work and travel in the bush. But I’ll take your word and read/review this book as soon as I can. Well, I may have interpreted ambiguity inappropriately. I’ve only read The Pea Pickers, and I’ve kept the impression that it was ambiguous rather than clear cut. But I read it almost ten years ago and I’m open to correction. Here is a quote from PP: “You ask … are we masquerading as boys. No, we are masquerading as life. We are in search of a country … the promised land …” (p.83). I am a fan, I read Langley over and over for my thesis and I still love her, love her writing. Eve/Steve was in love with boys time and again through PP, White Topee and Wilde Eve – all based on her journals. The wearing trousers thing is to do with wanting to be an ‘ideal’ Henry Lawson bushman. But just because I enjoy arguing doesn’t mean I’m always right. Not for the first time, I wish I still had my copy of The Pea Pickers! I do remember thinking when I read it that there were practicalities in dressing as a man: that way she and her sister had a much better chance of getting work as itinerants than women would. But you know, I don’t think it matters… certainly it was true that she was committed to an asylum – and probably had her brain fried with ECT there – for reasons that (as far as I know) remain obscure. In some way she didn’t fit the mould that society meant her to fit into, and I think that O’Flynn has captured the sad truth that being a nonconformist in old age can make a person vulnerable. Yes, I agree with Bill that she (Eve) was heterosexual from my reading – they dressed as boys to get jobs mainly, as I recollect in The pea pickers. She always seemed to fall in love with men. I’d be interested in this book. #TopSecret I have asked O’Flynn’s publisher if he’d like to do Meet An Aussie Author … and if he says, yes, I’m going to ask him about his research. Because I’m puzzled about why someone resolutely hetero would change a name to a man’s name – and that particular man’s name, by deed poll…. Oh good. Let’s hope he says yes. Sounds interesting. I often wonder how history’s more eccentric characters would fare in today’s society – in some cases they might be better off simply because we tolerate/understand more but on the other hand, we’re also less tolerant of people who stray wildly from the ‘norm’, meaning that people who are a bit eccentric can’t flourish. I think you’re right. People don’t care if you have green spikes in your hair or tatts on your nose, but they expect you to finish school, go to work, become self-sufficient and be a consumer just like everyone else. She sounds like a really interesting person/writer. I don’t care for imagined bios/novels about real people. I begin wondering what’s real and what’s imagined, so then I feel as though I should have just read a non fiction book in the first place. Ah, but there’s not really enough known about Eve Langley to write a non-fiction text. She was a recluse in her old age and they don’t even know exactly when she died because it was some time before her body was found. I don’t like fictionalised lives when a person’s real life is well known and well-documented, e.g. someone like Dickens. They can speak for themselves and authors shouldn’t mess with the historical record except for good reasons. But if we read to develop our empathetic selves, to imagine ourselves into the lives of others, then O’Flynn’s imagined old age of an eccentric Aussie author is well-worth reading IMO. That’s about what I suspected. I had a couple of bad experiences last year w/fiction books about real people and I swore off reading any more. On the wagon so to speak. Trying to be better when it comes to book picks and that includes avoiding my personal dislikes. Never say never I always say Guy. There are always, I find, exceptions to the rule. You just have to be a bit cluey about making those exceptions! Ain’t that the truth… how many times have I started a blog post with, ‘I don’t usually read.#insertGenre but…. You’ve got me interested Lisa! Seems like a good choice by Mark Flynn to call her “Ava Langdon” and make her book “The Apple Pickers” – makes it clear she’s based on Langley while creating enough distance to give him some freedom. Thanks Lisa, I just finished this book in one sitting. It was a good read, very witty. I always thought that Eve Langley was heterosexual. And, also that she was rebelling against society and its ‘norms’. Her dress and behaviour was not expected of a woman but she didn’t give a damn. And I love that ‘don’t give a damn’ attitude!